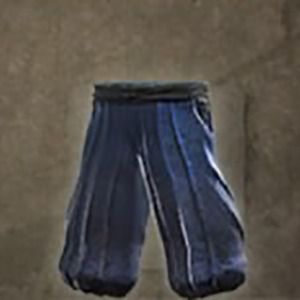 Hayabusa Shinobi Apparel: Hakama is a Leg Guards in Nioh. "This lower-body wear is modelled on the baggy pantaloons worn by the Portuguese, with the lower legs tucked into gaiters. By looking at the knees, skilled martial artists were able to gauge their opponent's next move, so loose-fitting legwear made it difficult to predict what the other party might do. It was used by the Hayabusa ninja, a proudly independent ninja clan based around a secret mountain. Much of the truth behind this secretive clan is shrouded in mystery, and only a secret few were privy to their arcane techniques. They differed from other clans in that they served no master and were motivated by profit; they were solely focus on ridding the lands of any evil that should attempt to sully it."